NYC, 04/30/2019, 6:30PM. Writing for Children and Young Adults Forum. 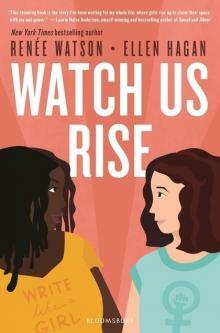 Renee Watson and Ellen Hagan discuss their new book Watch Us Rise. Renée Watson is a bestselling author, educator, and activist; her YA novel Piecing Me Together received a Newbery Honor and a Coretta Scott King Award, and her picture book Harlem’s Little Blackbird, illustrated by Christian Robinson, received several honors including an NAACP Image Award nomination in children’s literature. Watson is the founder of I, Too, Arts Collective, a nonprofit committed to fostering underrepresented voices in the arts. Ellen Hagan is a writer, performer, and educator whose poetry collections include Hemisphere and Crowned. Hagan is also the director of the poetry and theater departments at the DreamYard Project in the Bronx, N.Y., overseeing the International Poetry Exchange program.